C.Q. Cumber is a character in the Octo Expansion for Splatoon 2. He is a translucent blue sea cucumber (likely a sea pig) wearing a train conductor's hat. He is an employee of Kamabo Corporation, serving as the conductor of the Deepsea Metro, and is shown interacting with Cap'n Cuttlefish. He was first shown in the 8 March 2018 Nintendo Direct explaining the usage of the subway map to Agent 8. Upon receiving a CQ-80 and a CQ Card from the Telephone, Cap'n Cuttlefish and the newly christened Agent 8 board the Deepsea Metro. Once aboard, C.Q. Cumber introduces himself to the Captain and the Agent and adds 1000 CQ Points to the CQ Card. At each station, C.Q. Cumber instructs Agent 8–and, thus, the player–of the objective, the hazards, and requirements of the upcoming test. If Agent 8 continues to talk to him, C.Q. Cumber will tell them to “take care out there”, indicating he does care about them at least somewhat. If Agent 8 does something that either fails the test's requirements or precludes the possibility of completing the objective (e.g. causing an 8-Ball to fall off of the stage), then C.Q. Cumber informs them of this before declaring the test failed. Following the defeat of the final boss, C.Q. Cumber mentions that Kamabo Co. has ceased to exist. Despite this, he assures Agent 8 that the Deepsea Metro is still running, allowing Agent 8 to complete any tests that they missed. His name is a pun off his species name, "sea cucumber." Despite being an employee of Kamabo Corporation and, by extension, the Telephone, Hisashi Nogami has stated that C.Q. Cumber is "not a bad guy", only "faithful to his duties." C.Q. Cumber may be seen climbing on the wall near the entrance of a test chamber. If the player shoot at him, he will fall and land belly-up. According to Iso Padre , C.Q. Cumber is a close friend of his. Iso Padre also says that C.Q. Cumber "works his tail off morning, noon, and night." Sometimes when in the test fee room, C. Q. Cumber can be seen flattened out, or have spider-like legs, or his front legs are streched and waving it. C.Q. Cumber talking with Cap'n Cuttlefish. C.Q. Cumber as he appears in the reveal trailer for the Octo Expansion. C.Q. Cumber in a subway station. C.Q. Cumber in a subway car with two passengers. C.Q. 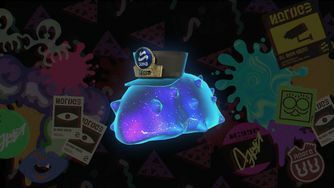 Cumber serves as the Deepsea Metro icon in the Inkopolis Square map. C.Q. Cumber's dialogue icon in the Octo Expansion. A spider-like form is sometimes assumed by C.Q. Cumber. C.Q. Cumber in concept art for Agent 8. C.Q. Cumber knocked down by Agent 8. ↑ Splatoon 2 1 Year Anniversary and Looking Back on Octo-Expansion! This page has been accessed 59,253 times.